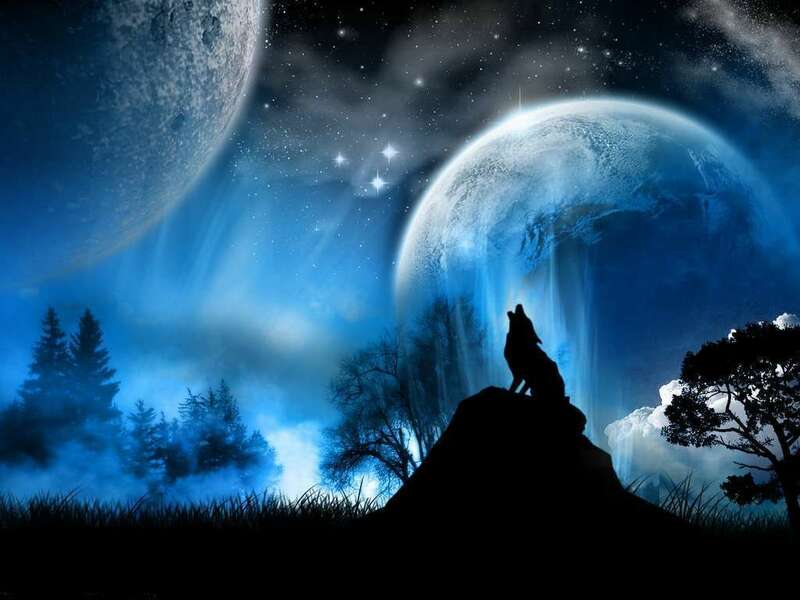 There are 20 posts in this thread, and it has been viewed 13014 times. How would you rate Robo Army? 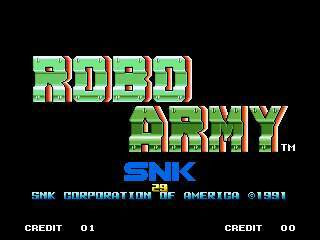 Robo Army is a beat-em-up game released in December 20, 1991 by SNK for the Neo Geo.The game uses three of the four default buttons of the Neo-Geo; A is used for attacking, B is used for jumping and C is used for specials. The player can transform his/her character into a futuristic car and run through the enemies as well. Well that's an interesting piece of trivia I didn't know! 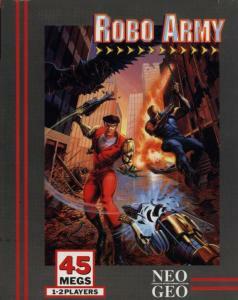 This was one of the first games I played and beat when discovering emulation a few years ago. It's a run-of-the-mill beat 'em up IMO. I've never actually played this, though I've been thinking about it for a long time now. Too much "Derp" can go a long way. Here's a present for the Cat. I really like this game despite it being old I still reckon the graphics are good and it plays good. Lots of nice looking levels and cool bosses I would say its my fave scrolling fighter on the NG its a shame I have only ever played the game alone as its probably a hoot in 2 player mode. On a different but still related note this title appears to be very scarce on MVS and NGCD, fortunately I have it on my multicart but would really like a genuine copy on any of the above. Its a OBG that means an oldie but a goodie. "We will use (the humans' ) brains to clone ourselves!" Most epic VG villain line ever? The main characters look like the inspiration behind Jax from MKII. The robots blowing up remind me of X-Men. It adds an authentic arcade experience. The rich coloured graphics certainly brought my attention to this game. Its beat 'em up features are not too very different from Final Fight, but its got more sub bosses than the average beat 'em up game. 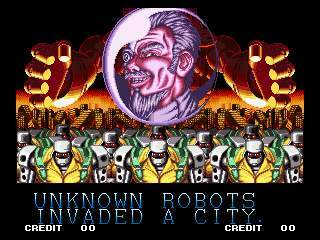 Many of those robots remind of the reploids from the Mega Man X series. The crushing power car feature is a promising weapon. This game overall seems to be outdo Cyber Lip, except it doesn't have a voiced dialogue. 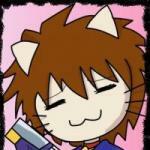 Yeah, such as "Power Metal" and "Cyber Ball". Only played through this once. I vaguely remember reading about it in a gaming magazine when I was a kid. Not the greatest, but I've played much worse. The Stray wrote:...I think the JP AES Insert looks better than that US/EU one (Not unlike the Fatal Fury US Insert). I'm actually fond of the Western art. It takes me back to when our animation was worthy of exhibition. Yeah, that and the shoddy Mega Man 1 US Art, but we all have our tastes do we. I believe much American game art of the 80s, whether action or not, was heavily influenced by the influx of action movies in Hollywood at the time. Japanese game art was more abstract. 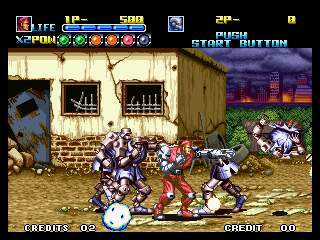 My 2nd favorite Neo beat,em up behind Mutation Nation. Fun game with good graphics that get way too much hate. I don't get the comment saying it's like Final Fight, because if anything, it's one of the b-mup the most different from Final Fight (no punch combo, no throws or grab, enemies that die in 2 or 3 hits, no life-draining special... ect). I've never played this, but it looks like tons of cheesey fun. I'll play it tonight. So I tried playing this last noche, but got bored playing with 1p. 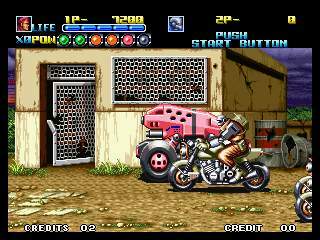 If anybody likes this game and you wanna play on Kawaks, online, PM me coz it's kinda dull to play a beat'em up with 1P.